Erik Weisz was constantly reinventing himself. His earliest performing was as a trapeze artist. When he moved on to magic, he took the name Harry Houdini. 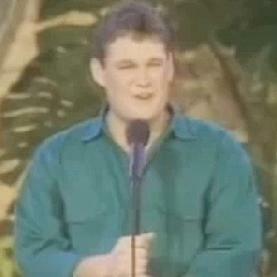 For some comedians it’s easy to find your groove and stay in it. I think sometimes there’s little difference between a groove and a rut. I doubt anyone today would remember Houdini the trapeze artist, or Ehrich The Prince of the Air as he was calling himself at the time. I don’t know how many of us would even remember Houdini the magician. It’s that third reinvention as an escape artist that brought Houdini his fame. I guess the modern day equivalent of this is Dan Whitney. He was your run of the mill road comic from Nebraska. 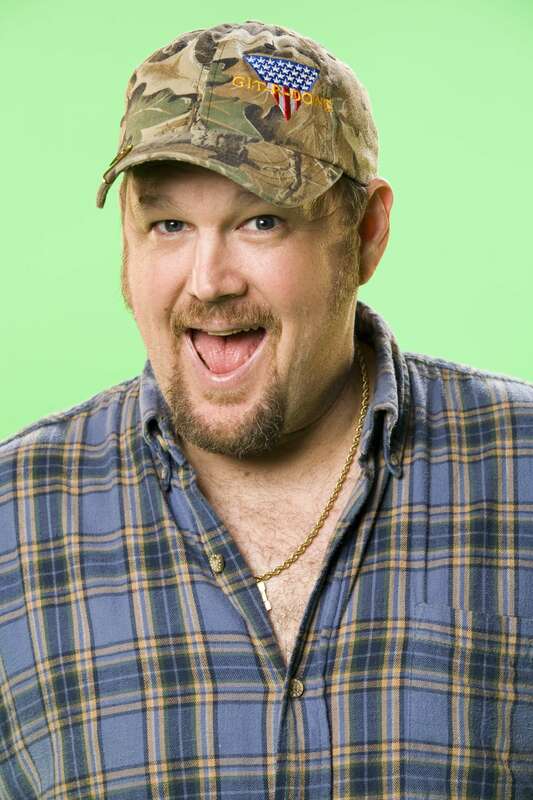 He didn’t really stand out until he reinvented himself as Larry the Cable Guy. While I don’t think most comics need to be that drastic, I think trying new things is incredibly important. I first envisioned myself as a nerd comic. That’s fine. Lots of people are doing it and it’s popular right now. Maybe that’s the thing that struck me about that. It’s popular right now. How long could I stay relevant doing what could certainly be a fad. I don’t think nerd comedy is a fad though. I think it’s a generational thing. If you look at a lot of the nerdy comics out there, they all seem to be somewhere between 30 and 45. While I don’t identify myself as a nerd comic anymore, there are still nerdy references in my act because that’s how I communicate. If you watch Marc Maron, he explains his point of view in a much more literary means because he’s a well read guy. I watch a lot of nerdy movies. Those are the glasses in which I see the world and the way I communicate it. Houdini was a great marketer. He had eye catching posters hyping his arrival to a town. If you look at the more successful road comics, they do the same thing. 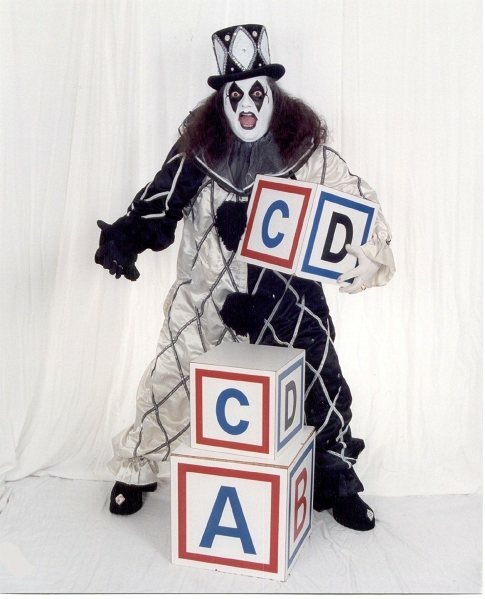 I’ve never seen the Disgruntled Clown perform, but I know who he is from his marketing. At the Funny Stop in Cuyahoga Falls,Ohio, the Disgruntled Clown had life sized posters of himself at the club plugging his upcoming date. And back to my earlier point, while I don’t know the Clown, he’s a great example of reinvention. I know he has another character named Rocker John. Comedy legend has it that sometimes he has Rocker John opening for the Disgruntled Clown giving himself the ability to collect two paychecks per performance. I don’t know if that’s true or not, but I like to believe it is. I also like to picture a poor emcee on stage trying to fill time while John puts on his clown make up in the kitchen of a roadhouse in central Indiana somewhere! My friend Mike Stanley may be a person you don’t know yet, but like Houdini, he’s a great ground floor marketer. He makes beautiful tour posters that catch the eye. Up until he died, Houdini was the President of the American Society of Magicians. He got magician groups from Kansas City to Buffalo to join. It makes me think of this new trend in comedy podcasts. You have these podcast networks like The Nerdist or Earwolf that end up taking on all these podcasts which ends up being beneficial to all parties. It gives these individual podcasts more presence and it makes the networks larger businesses. Chris Hardwick just sold his Nerdist empire to Legendary Entertainment. On a strictly stand up level, you have Chicago super group Comedians You Should Know. I know that I reference them a lot and that’s because in addition to being great performers, they’re great business people. They’ve created a brand for themselves. I would think the next step would be satellite branches of CYSK. At least that’s what I would do in their shoes. Right now, they’re a huge thing within Chicago, but I could see them growing beyond that. I imagine Houdini was like a lot of performers and got to be sick of his act. He was constantly inventing new grand escapes. In 1904, he did his Mirror Handcuff Challenge. In 1908, he added the Milk Can Escape to his act. 1912 was like his Louis CK period where it was just a ton of new stuff like his Chinese Water Torture Cell, Suspended Straightjacket Escape and Overboard Cardboard Box Escape. I just imagine him frustrated that he’d been a success for 13 years and getting a huge gush of inspiration to get out of his rut. He was at the top of his game, like Louis CK right now, and just wanted to keep pushing himself further and further. 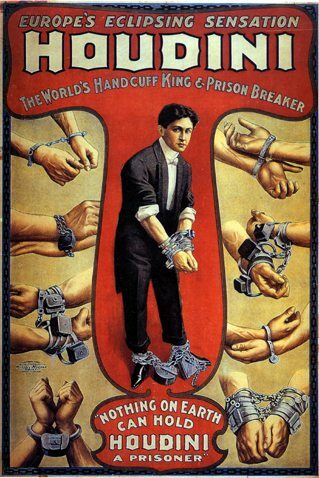 Like many of the performers of today, Houdini ended up doing movies too. Brian Regan said recently that he wanted people come to see him because he was a comic, not because he was playing something on a TV show or was the voice of something in a cartoon. But in that interview, he also admitted to wanting to start looking into those kinds of opportunities. Being in a movie or on a television show is a good way to gain an audience. I’m sure Houdini knew that in his time too. The last modern day comedy comparison I’ll make is to Gallagher. If you’re not a comedy nerd, you might not know that Gallagher let his brother take his act on the road as Gallagher Too. I believe the story goes that the original Gallagher would take half the US and his brother would take the other half. In Houdini’s time there was another performer, by the name of Theodore Hardeen, doing a lot of Houdini’s tricks and escapes. Hardeen, Houdini, the sound similar. Theodore Hardeen was born Frenecz Weisz, and was Harry Houdini’s little brother. In fact, early on they performed as The Brothers Houdini. The Weisz brothers didn’t have the animosity of the Gallagher brothers though! Regardless of what you’re pursuing in life, a lot can be learned from Houdini. You have to keep working hard and find new things that interest you. Don’t be afraid to try new things because chances are that new thing is a lot less scary than behind bound upside down while submerged in water! Posted on September 8, 2012, in Uncategorized and tagged Appleton, brian regan, Comedian, comedy, dan whitney, disgruntled clown, escape artist, gallagher, harry houdini, larry the cable guy, magic, Marc Maron, mike bobbitt, mike stanley, off the mike, offthemike, theodore hardeen, wisconsin. Bookmark the permalink. 4 Comments. Nicely done article. Thank you. (One minor correction/typo: Milk Can was 1908, not 1901). It’s been corrected! Thanks John! Nice job luring me in with Houdini, for the sole purpose of scaring us with the Disgruntled Clown picture, you evil genius. If I have to live knowing the Disgruntled Clown exists, then everyone else should have to as well!